DELIWAY provides best quality products with superb service, A Risk-Free Purchase is our warranty to you. If The Ceramic Tea light Holder is broken On arrival, please contact us to get a FREE replacement Or Full Refund. The Cut-out circular holde pattern allows light to go through,Lights through the holes cast beautiful patterns on wall/table with refreshing air spreading around. 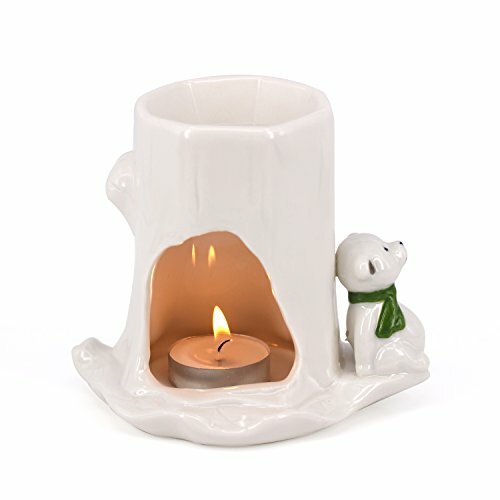 The Craftsman makes this essential oil burner Full of artistic with the lifelike animal and beautial candlestick holder. 1. Put a spoon of water & 5 - 10 drops of the oil into the bowl 2. Put a tea light into the body below the bowl. 3. Let the tea light warm the oil/water mixture to spread fragrance. The tea light warms up the essential oils in stone saucer to diffuse aromas and fragrance. Can be used as a diffuser, burner, or Great Decoration for Beauty Salons,Yoga Meditation,Living Room, Balcony, Patio, Porch & Garden. Size: 5.1" x 3.7" x 4.7" (13 cm x 9.5 cm x 12 cm), essential oil and candle are not included. Attention 1: After the water was burned out, the bowl will be very hot, you cant pour water into the bowl at this time, or the bowl will be broken. you can do this after the bowl is cool. Cut-out Circular Hole And Animal Reliefs Design-The Cut-out circular holde pattern allows light to go through,Lights through the holes cast beautiful patterns on wall/table with refreshing air spreading around. The Craftsman makes this essential oil burner Full of artistic with the lifelike animal and beautial candlestick holder.Great For Living room, Balcony, Spa Yaga Meditation, Patio, Porch and garden. The Beauty Of The Modelling And Handicap-The candlestick shape of this Fragrance Diffuser is made depending on the thinking of the "I" shaping of the dry tree. The workmanship is exquisite and delicate. The capacity of the top dish is much deeper and larger, You wont worry about the situation happening any more that the water will be dry very soon. Easy To Use-Pour about 2/3 water into the bowl and then 5 - 8 drops of the oil into the bowl, Put the candle into the candle holder and light the candle below. The tea light warms up the essential oils in stone saucer to diffuse aromas and fragrance. Size Dimension:5.1" x 3.7" x 4.7" (13 cm x 9.5 cm x 12 cm), essential oil and candle are not included. A Risk-Free Purchase! - If The Ceramic Tea light Holder is broken On arrival, please contact us to get a FREE replacement Or Full Refund. If you have any questions about this product by DELIWAY, contact us by completing and submitting the form below. If you are looking for a specif part number, please include it with your message.